Moorside Stadium, Droylsden, Manchester. This cinder track got underway on 25th June 1927 so it certainly stakes a claim as the UK's first speedway, but with council objections and poor crowds Droylsden's life was not a long one. The last meeting was staged 20th April 1929. Ken Ward says: George Dodd, a local landowner moved to the farm on Ashton Moss in 1920. His idea was to build a training track for his horses. During this period he was entering horses in events at the Nearby Audenshaw Trotting Stadium. 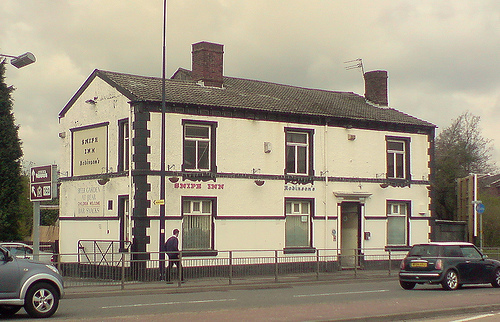 Ken Ward says: Both the Droylsden and Audenshaw tracks were behind the Snipe Inn. John says: That is amazing! We are talking a few hundred yards yet one track was called Droylsden and the other Audenshaw. The Snipe must have been frequented by both sets of spectators. You have to draw your own conclusion about where speedway was first staged in the UK. I find the item shown above to be of great personal interest to me as the insert shows some of the British bikes used. If only the British Bike Industry had embraced speedway perhaps some of the great old names would still be in business? In the late 1920s, dirt track racing quickly established itself as a significant presence in the north west of England. 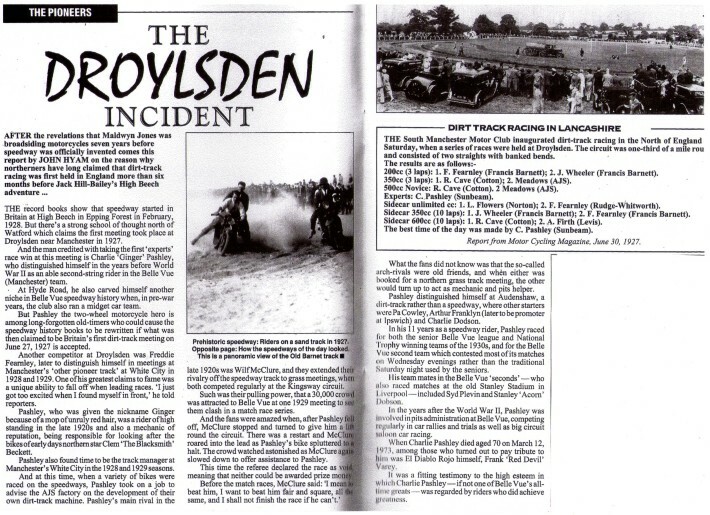 The region’s first post war race occurred on 25th June 1927, at the newly constructed Moorside Stadium, Droylsden. This meeting was organized by Harrison Gill of the South Manchester Motor Club. Who was later associated with Belle Vue. The meeting was run on a banked cinder circuit with racing being in an anti-clockwise direction. 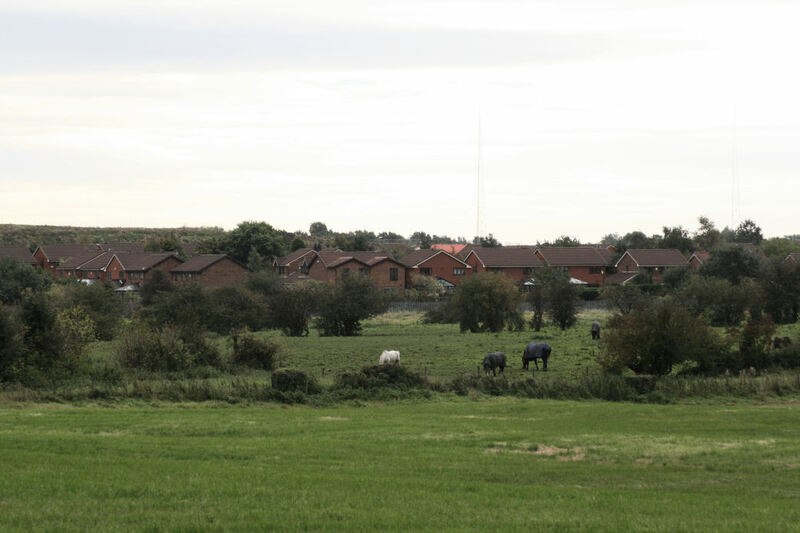 The owner was a local farmer George Dodd, his idea was to build a trotting track for his horses which he was racing at the nearby Snipe race track on Ashton Old Road, Audenshaw. Trotting was a popular pastime in the district around Ashton as well as in Stretford and Old Trafford. 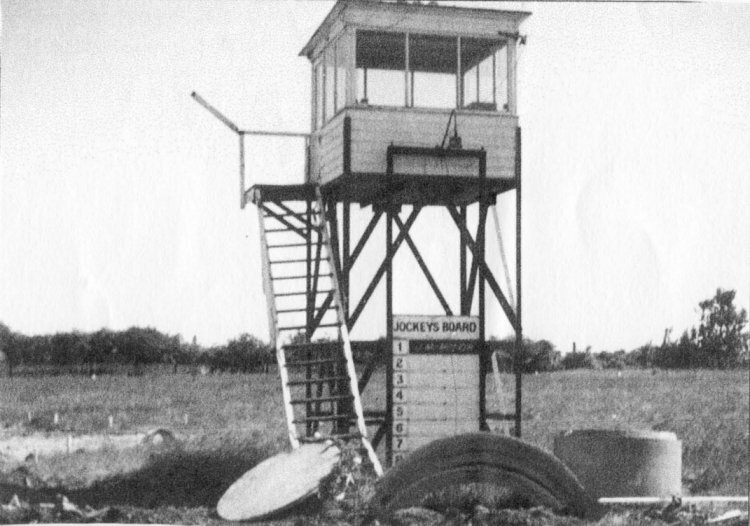 However, the local authority believed the Droylsdon track was much too dangerous, the quarter mile straight track allowed riders to get up too much speed to encounter the bends. Operations were suspended at Moorside Stadium after the last meeting was staged on 20th April, 1929. It was at the half mile track of the Audenshaw Racecourse, situated behind the Snipe Inn that dirt track motorcycle riding really took off. The track was active from 1928 to 1931. By today’s standards the track and its safety features were very primitive, though this was not unique to Audenshaw at the time. Prior to the first meeting on 3rd March 1928, the track had been used for trotting and athletic events. The riders averaged about 35 miles per hour. Prizes ranged from Gold Watches to Canteens of Cutlery, and Silver Cigarette Cases. 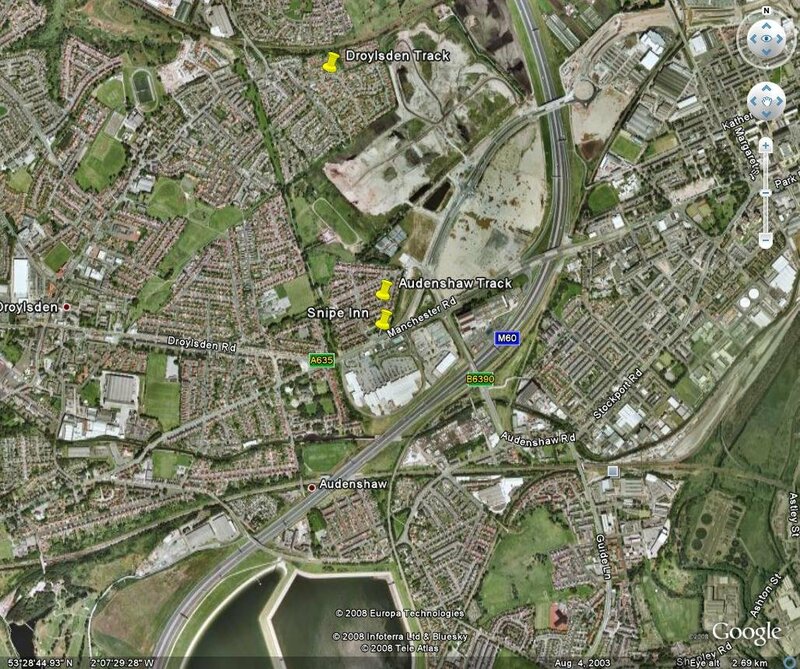 Both Droylsden and Audenshaw were the breeding grounds for many of speedways rising stars. The growing popularity of dirt track racing soon resulted in the construction of many new tracks designed specifically for racing motor cycles. Like the tracks at Droylsden and Audenshaw many were carved out of old cow pastures and fields. Some were located in natural amphitheatres with hill side standing. 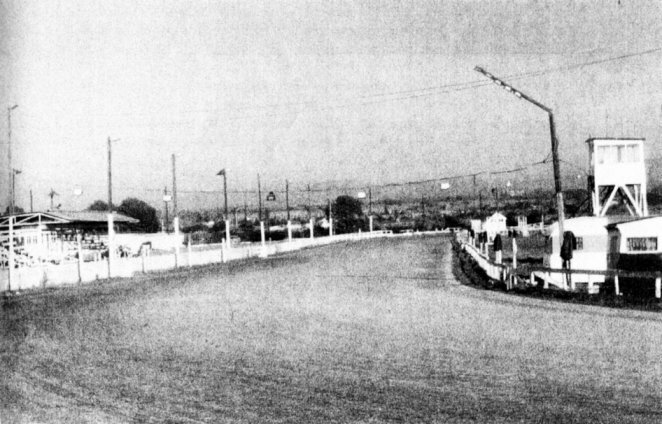 The new dirt tracks varied in configuration, with many continuing the half mile dirt track oval with variations of width, straight, curve radii, and a degree of dirt banking. Many tracks were designed by owners, promoters, and in some cases the riders themselves. At many of the early tracks, the racing action could easily overflow into the pits or into areas outside the track. There were two short lived efforts to stage dirt track racing at Spring Grove, Millbrook, Stalybridge; and New Mills Football Ground, Derbyshire. It was not uncommon for riders to race at weeknight and at the weekend. The prize money was not very good, and so many riders travelled from track to track to earn more, these riders quickly became household names and local celebrities. For many dirt track fans at early race meetings, the riders were heroes, and fans followed their exploits of their favourite rider on and off the track, just as football fans follow their favourite football player today. Many of the track events in the early years were devoid of press coverage, so apart from old programmes that have survived the test of time very little is known. The same names would appear in the pioneer years of dirt track race meetings. These included Ginger Lees, Frank Varey, Slider Shuttleworth, Clem Beckett, the Drew brothers, and Hyde’s very own Donald “Riskit”Riley. With a natural affinity for speed, “Riskit “would show his “stuff” whenever he sat behind the controls of a motor cycle, he was a real character on and off the race track and during the late 1920s and early 1930s became something of a real folk hero in his home town. Donald Francis Riley was born at 10 Hoviley Brow, Hyde, to James Riley and Clara Nuttall, who had married at Ashton Registry Office in 1890. Donald was the youngest of twelve children, seven sisters and four brothers, two of his sisters, Winifred and Clara died before Donald was born in December, 1909. Donald’s mother, Clara, died prematurely three years later in 1912, aged 41. At the age of 35 James Riley opened a shop selling fruit and vegetables; this was the beginning of a thriving fruiter business which continued to flourish up until 1942 when ill health forced him to close. After finishing school, Donald entered the employment of his father, who in the weekdays carried on his business at 10 Hoviley Brow, but on Friday’s and Saturday’s, he also ran a fruit and vegetable stall on Hyde Market where young Donald and his brothers helped out. He began riding motor cycles at an early age and when dirt track riding became all the rage in the north of England he wanted to try it. According to one old speedway pundit, Donald “Riskit” Riley got his first racing experience in 1928 as a fresh faced kid at the White City Stadium, Manchester. He would have been about eighteen at the time. He was just Riley then, dragging a heavy Norton round and hoping for pot luck on the bends. That was until one day his father, James Riley, went to see him in action, and he wasn’t over the moon with what he witnessed. When Riley, senior, got home, he told Donald he wasn’t impressed with what he had seen, and told is son as much. “Call yourself a speedway rider! Why, you’re not fit to push them off!” Donald set his jaw. “Ain’t I?” he said. Look here! If you can win a heat, I’ll buy you a bike,” said Riley senior. Next time out Donald won a heat, and true to his word Riley senior stumped up the cash for a new Douglas. By no stretch of the imagination could you call young Riley a consistent rider. But when he got that spark of inspiration he was a match for anyone. It was full throttle to the line, with no thought of personal danger. The first use of Riley’s famous nickname is to be found in a Speedway Programme for a meeting at Audenshaw in 1929. He allegedly got his nickname riding the “Wall of Death” at Belle Vue, but whether this is true is open to debate. 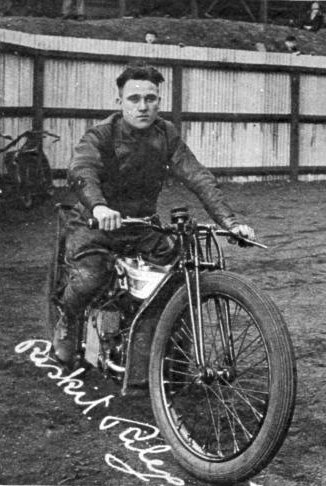 Inventing nicknames for riders, especially in the early days of the sport, such as “Riskit Riley”, was one way to sensationalise the sport. So when you’re a dirt track rider whose last name is Riley, and you’re taking spectacular risks on the dirt track, you really don’t have much choice: you have to be “Risket Riley”. The name stuck throughout his career and separated his fairly common name from the rest of the herd. “Riskit” wore a type of lace up metal shod clog which came up above the ankle bone. These acted like steel skates on corners. This was at a time when most of the early dirt track riders wore hob nail boots with a steel toe cap. Donald Riley, a fruitier, of Hoviley Brow, Hyde, well known in the district as the dirt track rider “Riskit” Riley, was summoned at Dukinfield Police Court on Thursday, for driving a motor cycle and combination in a dangerous manner. Inspector Murray stated that at 11-5 a.m. on Good Friday, he was on King Street, near the Queen’s Arms Hotel, when a motor cycle came along from the direction of Ashton. Visibility was bad owing to the fog, and it was impossible to see more than 80 yards ahead. When the motor cycle was approaching King Street and Wharf Street crossing the motor cycle combination, driven by Riley, came past at a fast pace. He put up his hand and the defendant pulled up over ten yards away. He told defendant he was driving too fast and asked him for his driving license. He was unable to produce it and stated he could not take it to the police station the same afternoon, because he was riding at White City, Manchester. The inspector replied “I think you are making this street into a practice track.” Inspector Murray added that in his opinion defendant was driving dangerously, and he trembled to think what would have happened if anyone had attempted to cross the street. In reply to the defendant the Inspector said he estimated the defendant’s speed over the cross roads at 25 miles per hour. William Lees, of Church Street, said defendant never sounded his horn, and he agreed with the police that the speed was dangerous at that particular point. Defendant said he was only driving at 15 miles per hour, and he could have pulled up much quicker had he thought the Inspector desired him to do so. Numerous speeding offences were recorded against Riley, Superintendent Brown stating that he had been fined £10 at Mottram and his license suspended for twelve months for dangerous driving. The magistrate now fined Riley 40s, and suspended his license for six months Defendant: Does that mean I cannot ride on the dirt track? The Clerk: You had better see a solicitor. In 1929 Riley became acquainted with 19 year-old Mabel Kisswetter, the daughter of a German immigrant, they commenced a tumultuous relationship, climaxing in a March marriage, at Chorlton on Medlock Registry Office in 1930. Their son, James (Jimmy) was born in 1931. Jimmy is today 81 years old, and lives with his wife Margaret in Manchester. Although Mabel had been courting Donald for the best part of a year, she had no idea that he had been having an affair with a girl from his home town of Hyde called Gladys Mottram. They had been seeing each other for about eighteen months, going for motorcycle trips to Blackpool and the outskirts of the Hyde, where there were still many quite lanes and secluded spots for young courting couples. In 1929 “Riskit” established himself as one of the top young dirt track riders in the country. At Belle Vue Speedway track on Hyde Road on Saturday, 1st June 1929 he won the Golden Gauntlet, his first major prize. Followers of dirt track racing will learn with pleasure of the success of Donald Riley, son of James Riley, fruiterer, of Hoviley Brow, Hyde, at Belle Vue Speedway on Saturday, when he won the Golden Gauntlet, his first big prize. “Riskit” Riley has he is known on the tracks, returned two of the best times of the night, 1/30.9 and 1/31.5. In addition to winning the Golden Gauntlet, he was also successful in the BelleVue Handicap. Riley is still only 19 years of age, and is said by leading speedway critics to have a great future on the racing track. Riskit climbed the podium for the second time on Saturday 20th July, when one of the largest crowds assembled at Belle Vue Speedway Stadium witness Riley give another display of supreme skill and speed in the mile race to win the premier prize, the golden helmet. Donald Riley, known on the dirt track as “Riskit Riley,” of Hoviley Brow, Hyde, achieved further successes at Bell Vue Speedway on Saturday. In the mile race he won the premier prize, the golden Helmet, given by the Manchester Motor Club, with a fine performance, in which all scratch riders took part. He is now regarded as one of the “stars” of the Belle Vue track, for Arthur Franklin and Frank Varey, both men of repute, are the only riders to secure this trophy. Riley the previous Wednesday beat Franklin, a very difficult thing to do. In his heat Riley put up the fastest time of the evening, covering the mile in 1min. 28.4 secs. He also won the Belle Vue Handicap in which there were some clever riders, he being the only scratch man. He beat Hurricane Hatch and George Corney, of Halifax, who only recently returned from Hamburg. Riley a few weeks ago won the golden gauntlet also for the mile scratch race, but he has never ridden better than he did on Saturday. His success is the more remarkable when it is pointed out that this is his first season as a dirt track rider, that he is only 19 years of age and has only been racing since March. He has completed against such well known experts as Frank Arthur, the Australian, of the International Speedway Company, and has won a good number of prizes. He is a fearless rider and keeps good control of his machine. I think it’s fair to say that by the close of the 1929 Speedway Season, Riley had the speedway world at his feet. However, his burgeoning dirt track career seemed to rise in conjunction with his capacity for getting in trouble. Donald Riley, otherwise known as “Riskit” Riley, of dirt track fame and residing in Thorncliff Grove, Chorlton on Medlock, was bound over for 12 months at Manchester City police court, on Thursday, on a charge of having obtained £1 by false pretenses from Mr. Wilfred Blundell of Smithfield Market. It was explained that Riley went to Mr.Blundell and represented falsely that he had been sent for money by his father for motor parts. Riley’s father said his son had done no work since leaving school. He had spent £200 in furnishing him with two motor cycles for dirt track riding. For a time his son had done exceedingly well in that sport. Answering his son, Mr.Riley said it was true that though he had won about £500 at Belle Vue last year he had to pay a mechanic £5 a week and his machines cost a lot in repairs. His son had also got into bad company, and had concentrated debts by borrowing which he had to repay. On being appealed to by his son from the dock, the senior Mr.Riley said he would repay the £1 mentioned in the charge. Riskit was also fined 10shillings for having sounded his motor horn when not necessary on the ground of safety. Riskit’s freewheeling lifestyle finally caught up with him again a month later, when he his ex-girlfriend Gladys Mottram hauled him up before Hyde Police Court on a paternity charge. Well known speedway rider Donald Riley, 15 Thornton Avenue, Oxford Road, Manchester, was the defendant at Hyde Court, on Thursday, in a case in which Gladys Mottram, age nineteen, 119 Croft Street, Hyde, applied for an order of paternity in respect of a male child born on August 23rd. Mr.John Westbrook, solicitor, Hyde, appeared for the complainant. Mr.Harold Bostock, solicitor, Hyde, appeared for the defendant, who denied paternity. Mr.Westbrook said that the defendant was a professional dirt track rider, well known in the town as “Riskit Riley”. He thought when the magistrates had heard the evidence that they would agree he showed a considerable amount of effrontery in denying the paternity of the child. The parties first met eighteen months ago. Subsequently they met several times, and in October, 1929, the defendant and his friend met complainant and her friend-Miss Taylor, in Hyde, and they all went to Blackpool to see the illuminations in the defendant’s motor car. On the way back, on Belmont , intimacy took place. Defendant lived in Hyde with his father, who was a well known tradesman, but left and she did not know his address. When he found that she was making enquiries about him, he saw her, and said “If I am the father I am the father, and we shall have to see how things turn out.” He said if he had not been married he would have married her. That was the first time Miss Mottram knew that he was married. He was married after the association with the complainant. Mr.Westbrook said that the defendant persuaded the complainant to see a person in Ashton who, he said, could do something for her. On the Hyde Carnival night in June, the defendant went to see the complainant at her home, and told her that his wife was “expecting” and he did not want her to know anything about the matter. He saw her parents, and frankly admitted the paternity, and said that he would see what could be done when the child was born. Later he approached Miss Taylor, the complainant’s friend, on two occasions with the object of keeping her out of court. Once he offered her money if she would stay away from court or give evidence for him. She indignantly repudiated the suggestion. The clerk of the court: That is a rather serious offence. Gladys Mottram then described the various meetings with Riley. She and her friend met Riley and his friend at Broomstair Bridge on the occasion of the Blackpool trip. Speaking of the visit of Riley to her home she said he sent a young woman to the door, and she came out to him. He said “If I am the father I am the father, but I can’t marry you, as I am already married.” He told her about a woman in Ashton , and she went with him. The woman told her that she was not the only one he had taken to her. On carnival night, when he went to her home, he said to her “Don’t forget if it’s a little boy, call it after me.” She replied “If it turns out to be like you I will drown it.” Riley left, and returned when her father and mother were at home. He asked her mother to lend him ten shillings and he would give her a pound for it the following Monday. Her mother could not let him have the money, and asked him what he thought about himself. He replied “I admit that it is my child.” She told him that he should have thought about that before he got married. He told her that he did not want to go to court. Her confinement expenses, she said, were two guineas doctor’s fee two guineas for the nurse, and 23 shillings and sixpence for baby clothes. She had special nourishments. Mr. Bostock asked the magistrates leave to speak in private to his client, who was accompanied by his wife. After a short absence Mr. Bostock told the magistrates that after his conversation with his client he was not in a position to put him in the box, and he could not really oppose the order. Kathleen Taylor, 3 Hall Street, Kingston, gave corroborative evidence. She said that Riley offered her money to stay out of court. Mr. Bostock said that the case resolved itself into a question of means. Defendant as a dirt track rider was highly successful until twelve months ago. Since then he had not been riding regularly, and had only appeared at meetings on Sunday; there was no appearance money, and he had to win or get nothing. During the whole of the year he had won £32in prize money, and had to borrow a motor cycle to appear. His agreement with the owner was for half the winnings, and he had to bear half the cost of repairs and conveyance. His net earnings were £3 10s for the period. He was not in the employment of any dirt track company. He was married on 4th January this year, and had resided with his wife and her parents for nearly the whole of the period, and was dependent for his keep on his wife and her parents. He was doing some work on Hyde Market, but had not a regular wage, and his receipts from that source did not amount to more than ten shillings per week. Mr. Westbrook said that in view of what Mr. Bostock had said, he was entitled to point out that during certain proceedings in September, the defendant stated in court that his earnings last year from dirt track riding were £500, and he had to pay £3 per week for a mechanic out of that. The magistrates made an order of 10s per week until the child reaches 16 years of age, and allowed £8 expenses and two guineas advocate’s fee, and witnesses expenses. After the scandalous revelation that he had fathered an illegitimate child and tried to procure a back street abortion in Ashton, Riley’s personal difficulties increased. His stormy tempestuous union with Mabel Kisswetter ended on the sharpest of rocks. He was pursued through the court for years for child maintenance, and in May 1931 sent to prison for fourteen days for obtaining 5s by false pretenses, with intent to defraud. The Chief Constable said Riley was a married man living apart from his wife and they were holding over a commitment in respect of arrears under an affiliation order until after that case was heard. Riley was very unsatisfactory and had previously been bound over on a charge of false pretenses. Donald Francis “Riskit” Riley died in 1951 in Manchester, a lonely, broken man – estranged from his family and speedway, he was 41 years old. A sad ending to a remarkable but troubled life. It was his inability to separate his domestic problems from his professional speedway career that prevented him from reaching his true potential on the dirt track. Although it is seventy year since “Riskit” stood selling fruit and veg on Hyde Market for his father, he is still fondly remembered by many old Hydonians. Hyde’s produced several so called sports personalities: swimmers, soccer players, athletes and boxers, but all pale in comparison to speedway ace Donald “Riskit” Riley, on and off the track he lived his life to the full, he was the Errol Flynn of speedway. Though his speedway career may have been relatively short, he is still fondly remembered as one of the most colourful characters from the early days of dirt track racing in Manchester.